See The High Scores LIVE at 8:30 on Tuesday, October 6th. We'll be at 'The City' Theater at Broadway Comedy Club - 318 W. 53rd (btwn 8th & 9th). 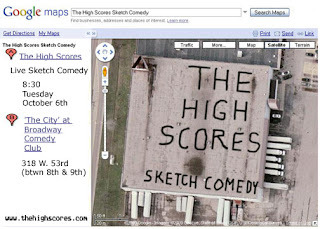 Only $5 and a drink to see some great sketch comedy. Thanks to everyone who made it out Tuesday. Good times. Special thanks to Sheldrake Boothroy - VERY excellent monoscene improv. See us back at 'The City' at Broadway Comedy Club next month - Tuesday, October 6th at 8:30. More wacky news and updates later.